In earlier years, I've featured Kelly's words and one of his 11/11 Pogo strips. I've also previously highlighted some of Wilfred Owen's poetry. 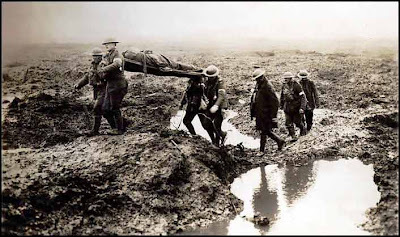 World War I remains one of the most horrific of any wars, and is the reason 11/11 (Armistice Day, Remembrance Day, Veterans' Day) is observed. I continue to wish it was studied more. 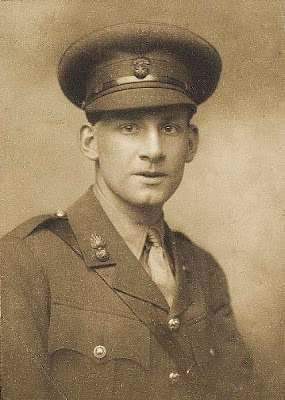 Owen, who fought in WWI, is still probably my favorite war poet, but his friend, fellow soldier and war poet Siegfried Sassoon possessed a dark, biting wit. Their friendship has been depicted in several fictionalized accounts, including the award-winning novel Regeneration. Here's a selection of Sassoon's work. never seen so many dead before." --War Correspondent. Who put that silly gag in some one's head? "How many dead? As many as ever you wish. Don't count 'em; they're too many. By Jove, those flying-chaps of ours are fine! ‘Ah, yes, but it’s the Press that leads the way! This is beautifully done. Thank you for putting this together. Thank you very much for including these. I covered WWI poetry in an English class when I was in college, but hadn't read these works in years and years. Bittersweet reading two years on, and no doubt it shall also be the same twenty years from now. ... about such terrible things. Take the GOP Talking Point Quiz!